This is so easy to use and works perfectly! Works great and no more guessing if a battery is good or not. I will be ordering more for friends/family. This is a lifesaver - no more battery guessing. The portable design makes it perfect to take to a friends house to check their batteries as well. That is until their order ships. Great product. Saves a lot of time when you have to change a battery for smoke detectors, clocks, remotes and so many other items that use batteries. With this item your batteries are all up to date. I hated it before when I had to keep trying every battery to find one that works. Saves time and money because you can test your battery before inserting it into your clock, remote or any other item that needs batteries also smoke detectors. I use to have to keep trying different batteries to see which one was still good. I bought many of this product. I keep one in every room that has something that uses a battery. 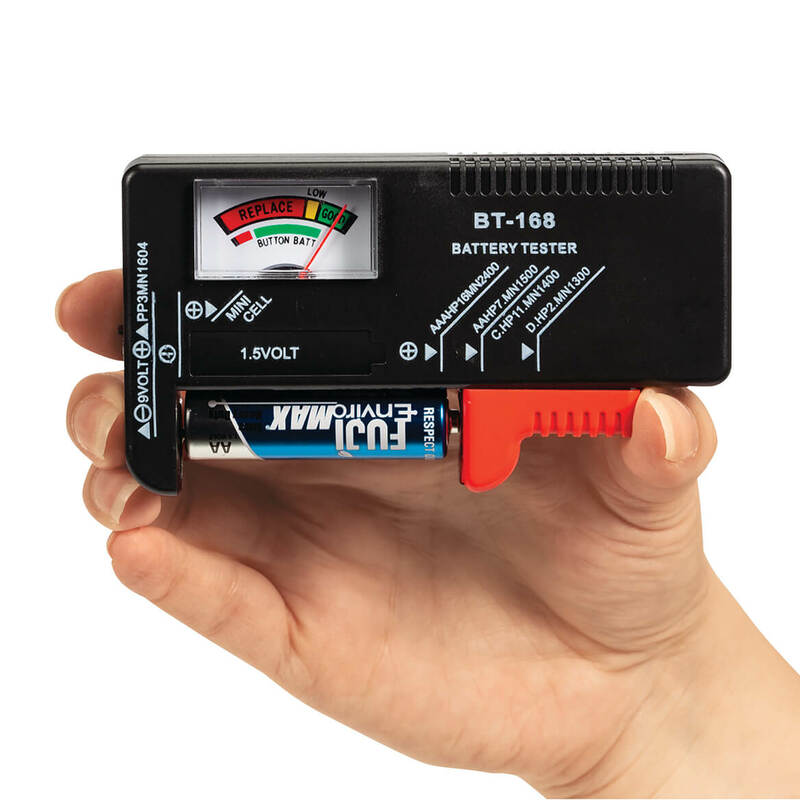 This battery tester is great! We have this on the side of the fridge always. We check every battery that comes out of a toy or appliance, so we never throw away a good battery! WOULD ABSOLUTELY RECOMMEND TO EVERYONE!! THIS IS THE ABSOLUTE BEST PRODUCT IVE EVER PURCHASED FOR MY HUSBAND!! HE WENT THROUGH ALL OUR OLD BATTERIES AND FOUND OUT WHAT WAS GOOD AND BAD. IT EVEN SHOWS IF THEY R WEAK OR GOOD! WE RECOMMEND THIS TO EVERYONE !! I think I would buy this again. I was going to give this as a gift, but I have decided to keep it for myself. Time will tell how long it will work for me. The Hand Held Battery Tester is a must to have. It is small in size but really does a great job testing the many batteries I use. The LED Indicator lights are bright that really has a noticeable and sense able reading when, testing batteries. Very light weighted and the telescope tester really makes it easier to test batteries sizes. Loved it! Not much to break down on this handy little device. It tests all kinds and sizes of batteries. I have used mine for several years with no problems. It tells me faithfully which are good, which are bad, and which have SOME life left. I'm so happy with the tester, I bought one for each of my family members. I can tell by this tester if it's the batteries that are bad, or the device!! I love having it handy in the battery drawer. I just test it and I know the grandchildren wants a battery I can ck some ad know if they are good I have purchased 3 of these. I had the first one for 10 years and I suspect my grand children broke the next one. Now I have another one and I missed it so much when mine got broke. I have had this for years and it still works great. I am so excited that I found it again because I am ordering 3 more for my kids. Great for checking batteries in toys. Then you know if the battery is low or the toy is broken. I had looked in every store I went into for a battery tester and could only find the bulky ones. This item is small enough to put in your purse or pocket so that's it ready for any battery that needs testing. I liked mine so well, I ordered another one for my adult daughter. No more wondering if my batteries are good or not. You can even check 9 volt batteries. Great to have in my battery box. Well, there is only one use for it bit it works very well. I have had one for years. Glad to see I can get more. I leave it on the frig till I need it. It's always there till I need it. Easy to use. This little battery tester really works! To test its accuracy, I tested all sorts of battery sizes, new, old, and everything in-between. I then put the batteries in radios, remote controls, etc. The tester was spot on each time. Now, I am usually a skeptic about little gadgets like these, but this little thing has saved me from throwing away perfectly good batteries in the trash. I am now a believer. Absolutely, I would recommend this tester to family, friends, co-workers and whomever else. :) Please don't stop carrying these! Had one before and lost it. Love it. Know when to throw away batteries. Can test all size batteries, even 9V, in a second. A very handy tool that works!!! This was a gift for my grandson and he is very happy with it,. Nice little device to check your batteries. Works just fine. Easy to use. I bought them for all my kids and they like them as much as I did. Never seen anything like this anywhere else. Quick reading to test a battery for continued usage or throw them away. A great buy. I had a big box of batteries of varying ages and didn't know the good from the bad until I used this handy device! I liked this so much that I bought several for my friends. Easy to use ,even does 9volt and button batteries! Love this to test batteries especially if we're un-sure of their age or strength. I finally cleaned out my battery drawer! I have been putting off cleaning out my kitchen drawer that was filled with good and bad batteries. It was very time consuming to try to put them to use and find out they did not work. Now I have an easy way to check them instantly. Great and price even better! I looked all over town and in our well-known super store that should have just about everything in stock. No one sold a battery tester. I bought yours and within minutes of using it, I had a pile of dead or low voltage batteries tested and ready to re-cycle. The only thing I would improve is adding a button battery testing. How long will this charge last? We have stored batteries in many sizes, some rechargeable and others not. The variety of battery powered toys, tools, timekeepers and more, makes estimation of expiration dates close to impossible. This tester helps us avoid loosing all battery "back-up" at the same time. A very handy little gadget. I just wish it wasn't quite so flimsy. It doesn't take up much room in my drawer and seems to work fine It will come in handy. You can test all sizes of batteries. To test all the batteries that don't work. This has been very handy, but it is smaller than I had thought. I've used many times. I recommend it. As previous reviews noted, the tester is made from plastic and may break easily. But it works--so that's the bottom line for me. If it had been sturdier I would have used the attached keyring to keep it readily available on my purse or bookbag, but since it's going to break easily I'm keeping it carefully wrapped in the cheap box it came in for extra protection. But for the money, what can you say? It works! We use only rechargeable batteries and this product lets us know when to recharge. It saves us from charging all of the batteries every time. I had one for years and have worn it out! This is my replacement item....I didn't give it 5 stars because it is a bit flimsy. But I still recommend it highly! I have bought a few of these. They last a god while. I use it for home. remotes, cd players, mp3 players,etc. if player is acting up. This ia great knowing if it is a low battery or the machinery is broken. I have ordered one -didn't work. Ordered another one- didn't work. Bad product. I keep an assortment of batteries that need checking . Also to see if I need to discard any. I bought this for the convenience of testing my batteries, but I don't think it is very accurate. I used my voltmeter to compare what this device was saying and for my batteries that were very weak, this device showed them as strong. It never registered any of them as weak unless they were totally dead. The company sent me a replacement one of these since the first one did not work. The replacement one does not work either! Practically dead batteries show up as strong. I also take a new packaged battery to test it and it comes up strong. It just does not work at all! SHOULD BE REMOVED FROM CATALOG! I had been looking for a replacement for the one I had for years. Very happy to find it. However, first tester rated weak batteries as strong. Second tester did the same thing. Don't know how to resolve this problem. Item made VERY cheaply. Could not et it to work on ANY of my batteries. battery tester does not work! Says all batteries are strong. Waste of money. So disappointed!! The tester tested all batteries good, even ones thaa would not light a flashlight! It is much smaller than the older models and will fit in my hand better. We are always trying to figure out f the batteries are good, or if it's another problem. this should help! I have one I bought from Walter Drake similar and have used it for over 20 years. It always works perfectly. I think my daughter needs one, so it's going in her Christmas stocking. Need this for my home. At times I mix batteries with news ones and need to know if the batteries are good. Seems like a very handy tool to have. I'm changing my smoke alarm's 9 volt batteries, but there is not a way to tell if they need to be replaced yet. I might be wasting money if I'm throwing these batteries in good condition with charge. Need to check my batteries. I have a Tupperware full of batteries and I'm sure my son got old and new mixed up in the container. I used to have one; but didn't replace it when it quit working. I often have wanted a replacement. To avoid keeping dead batteries and to avoid throwing away good batteries. I want to see what batteries I can get rid of. I wanted to be able to check the batteries for several small items without having to take out and put back in batteries that were in need of replacement. This should accomplish this quite well. Needed one. Sometimes batteries, even new ones don't last too long or work. I had ordered one for my mother years ago and regretted not buying more for myself. This is a great tool to have around the house. Well use lots of batteries and need this to know for sure if they are charging correctly..hope it works..
We always have loose batteries in our 'battery' drawer and I am never sure if they are good or not. This will take the guess work out that issue. My husband checks batteries with a multimeter. This looks like it will be handy and make a great stocking stuffer. Have one in use already and it works great. Got this for someone else. My husband took mine, so now I will hide this one. I dont know because doesnt work. So I can throw away batteries that are no longer good. Always so many Batteries around here! We have one of these and really like it, so decided to order one for the shop. always finding loose batteries and not knowing if they are still good. AM RECHARGING BATTERIES AND WANT TO HAVE TWO TO CHECK OR FILLING EFFICIENCY. does the battery tester need batteries to operate? BEST ANSWER: Thank you for your question. This item does not require additional batteries for operation. The only battery needed is the one being tested. We hope this information will be of help to you. 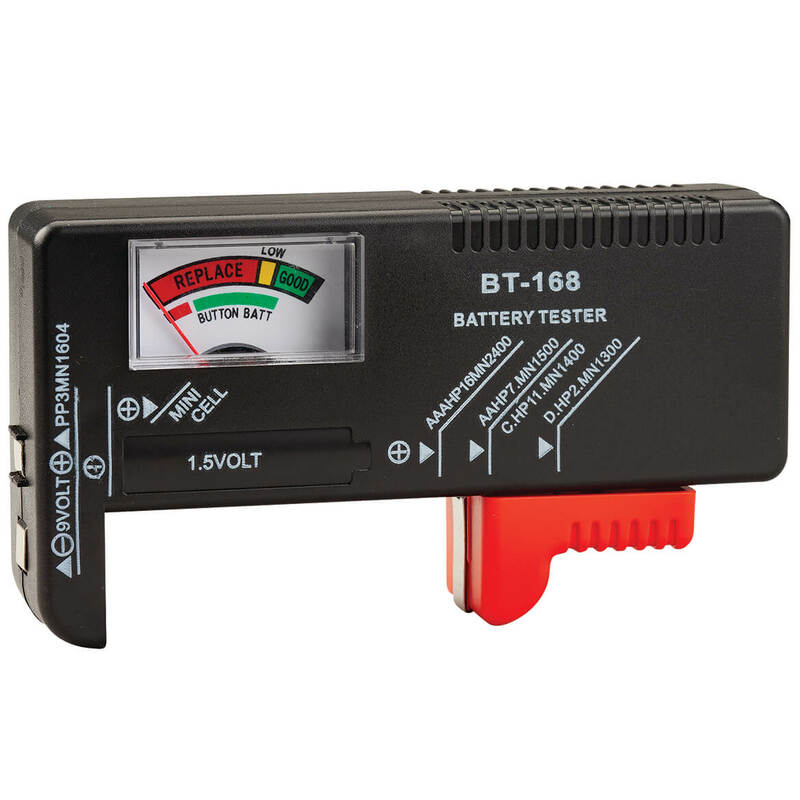 How does the battery tester work, is it powered by batteries, is it electric or what? BEST ANSWER: Thank you for your question. It is powered by the batteries you are testing. We hope this information will be of help to you. does unit run on batteries? BEST ANSWER: Thank you for your question. This item does not requires batteries to function. The battery that is being tested is all that is needed to operate this item. We hope this information will be of help to you.